The canonical online example is Moo.com with its adorably anthropomorphised Little Moo robot personality. An oft-cited offline paragon is Innocent Smoothies with their cheeky little packaging easter egg delighters. My favourite meatspace exemplar is right here in Brighton. The Earth and Stars pub has an outside chalkboard with a distinct personality. Over the past two years, I’ve been chronicling its announcements on Flickr. All the chalkboards inside think they’re so special! They seem to forget that I was here first! If I can see off the English weather, then I can certainly see off those punks! What are you looking at? I’ve told you before that it’s rude to stare! Be warned… I’m the chalkboard Kung Fu champion and not afraid to use my skills. So bored of this job. I don’t want to be a chalkboard anymore. I wish I’d paid more attention in woodwork, I could have been a skateboard or a sun-lounger… at least I’m not a chopping board. Stop looking at me like I’m a waste of space! I’m not just a chalkboard you know! I’m also a supporting wall. I provide shelter from wild beasts and tropical storms. Go inside so I don’t have to see you! Call me paranoid but I’m sure someone’s watching me, some are even taking pictures. 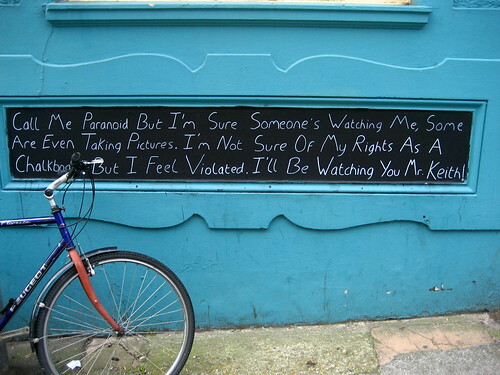 I’m not sure of my rights as a chalkboard, but I feel violated. I’ll be watching you Mr. Keith! I’m being cyberstalked by a paranoid existentialist chalkboard.